Impressions of a Reader...: This n' That: NJ Bloggers + Surprises & Thanks! A week ago today, I had the pleasure of meeting with my fellow New Jersey bloggers. We are trying to meet at least once per season, if not more often, depending on our busy schedules. It was a pleasure meeting with Christine, Mariana and Natalie again! This time Mariana chose the place and we met at The Melting Pot in Hoboken where they serve everything fondue! 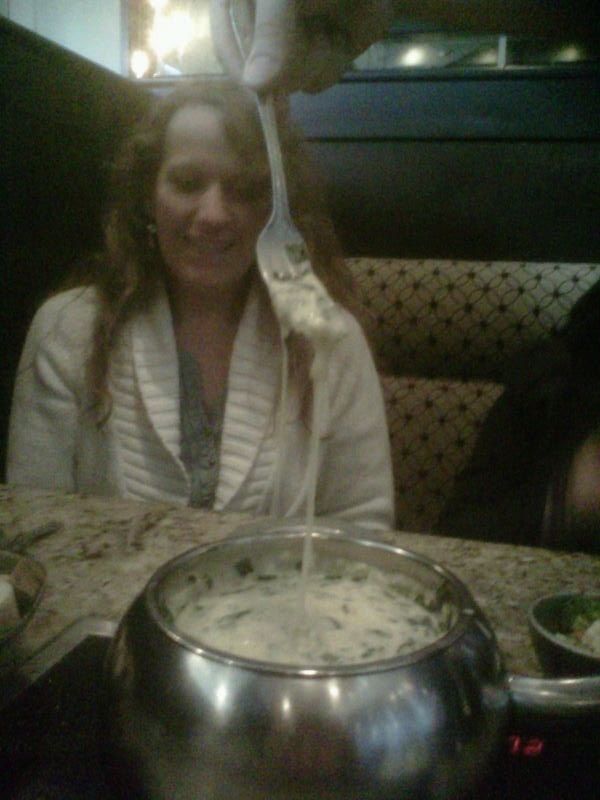 Cheese fondue -- just look at Christine's smile in the picture above! ;p We ended up having a yummy lunch filled with ooohs and ahhhs. 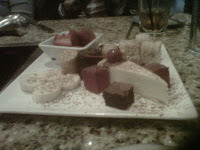 Lunch was good, but the dessert was the piece de resistance! The Yin & Yang combination of melted white and dark chocolate was a sight to behold and I don't think there was enough left at the end to lick the bowl. LOL! We all loved it, and I walked away dreaming of strawberries and cheesecake dipped in chocolate. 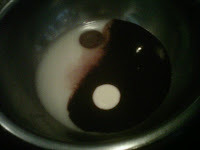 Check out my grainy pictures, doesn't that dessert look yummy? Of course we also discussed books and our latest reads. Christine shared how much she enjoyed her latest read Eon by Alison Goodman, and she and Mariana recommended it to the rest of us. Natalie shared her surprise with her enjoyment of latest read Homefront by Kristin Hannah, and that turned out to be great because I just happened to have a book by this author in my bag of goodies that she took home with her! Mariana was all about our latest Internet Book Club read The Lover's Dictionary by David Levithan, and I was waxing poetic about He Will Laugh by Douglas Ray and the merits of poetry (lol), plus the latest release by Victoria Alexander, My Wicked Little Lies. Thank you ladies for a great time! It was a wonderful, wonderful afternoon! I do have two other great ladies I would like to thank. Back in November I put up two posts -- one post was about Pamela Morsi books I purchased and the other post about Mary Balogh books I received from my friend Reny. 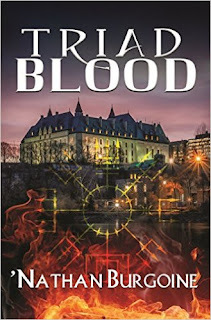 In one I mentioned that I had been looking for a particular book by Ms. Balogh, and in the comments area of the other there were some great recommendations from the wonderful readers/bloggers that visit. As a result, I received two books in the mail from two generous and thoughtful ladies! In the comments area of the Morsi post, JenM recommended The Charm School by Susan Wiggs (1999). When I mentioned that I had only read contemporary romances by this author, but had never read her historical romances, she offered to send me the book and did so immediately. I was quite touched by Jen's generosity! Then! I mentioned that I was missing Indiscreet (The Four Horsemen of the Apocalypse #1) by Mary Balogh (1997), to complete the series, but that it was next to impossible to find the book at a reasonable price. Well, I received a wonderful surprise on Valentine's Day when a copy of this book arrived at my door all the way from Canada from sweet Ames! She found it at a used book store and thought of me. She made my day! Thank you JenM and Ames for your generosity and thoughtfulness! How fun, to meet up with fellow bloggers! I wish I knew more readers around my way, seems like such a great thing to do. Glad you all had fun, everything looks yummy. One thing I love about the reader community is the helpfulness and the generosity, especially with Romance readers. When we love something, we want to share it. I hope you like Charm School, I remember I read that one a few years ago and thought it was nice. Oh man, you haven't read any of Wiggs' historicals? I'm still working through her mammoth backlist, but I've really enjoyed a great many of them! Now, I'm curious about Eon... and Homefront, is that the newest book by Ms Hannah, because that one looks good. Aw, Hils! What a nice post! I loved seeing you, Hils, and Mariana and Natalie, too. Can't wait to get together again... soon, I hope! Sounds like a wonderful catch-up! One day I'm going to get myself to NY! And I've heard some good things about Conor's Way and have a note to buy it - I must get on to that as it sounds great! Agree with Wendy about Wiggs' historicals. Love them! The Lightkeeper is one of my favorites. Jen, thanks again for the book and for both recommendations. I'm hoping to read The Charm School as part of the TBR Challenge and Conor's Way won't be in there too long either. I also have a few of Guhrke's Victorians in my TBR... should get to them! Can't wait to you, Mariana and Natalie again. Soon, I hope! Orannia, come by NYC! You would love it. I'll look forward to YOUR thoughts on Conor's Way too. I'll be reading it soon. Oh... thanks for recommending The Lightkeeper by Wiggs, I'm reading The Charm School and then you know me... I'll be checking out that extensive backlist. I'm going to give Eon a shot! I don't enough of those to make it passe. LOL! Ohhh... Click on the picture to make it bigger! You'll see the gooey, yummy, cheese!